Burton have signed ex-Royal Antwerp defender Kelvin Maynard for the rest of the season and goalkeeper Remi Matthews has arrived on loan from Norwich. Maynard, 27, has been without a club since leaving the Belgian second division side in July. He is reunited with ex-Royal Antwerp boss Jimmy Floyd Hasselbaink at Burton. Matthews, 20, who is yet to make a Football League appearance, has been brought in for a month after an injury to Yeovil Town loanee Chris Weale. 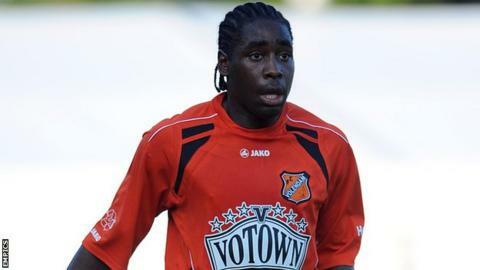 Suriname-born Maynard started his career in the Netherlands with FC Volendam and has also played in Portugal and Hungry. He and Matthews could make their debuts in Saturday's game at Shrewsbury Town. Meanwhile, the Brewers have also extended the loan of midfielder Darragh Lenihan from Blackburn Rovers until 3 January. The 20-year-old has played three games since making his Football League debut against Wycombe Wanderers earlier this month.